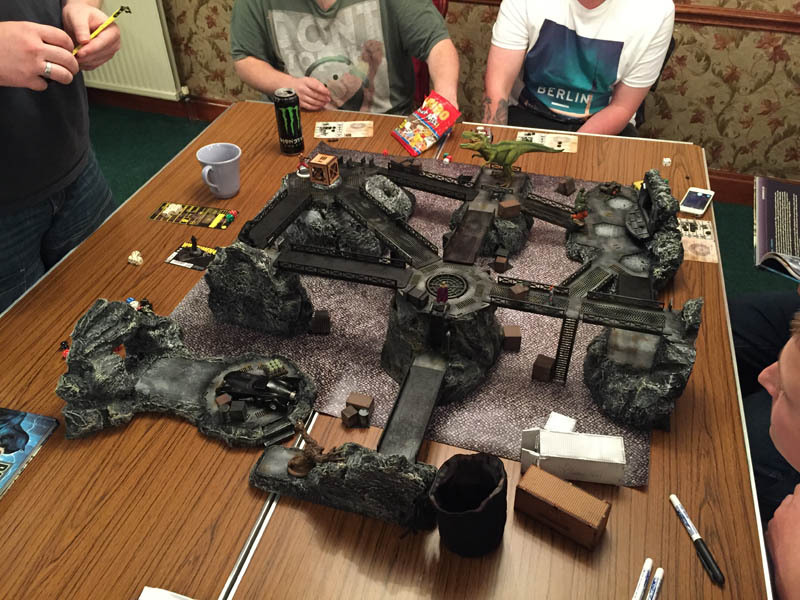 To celebrate Ian finishing his Bat Cave board, last night (20/08/2015) at West Coast Gamers Aspatria, we played a “Royal Rumble” Style Batman Game. 9 of us each chose one character (either a leader, sidekick or free agent, as henchmen would be underpowered! 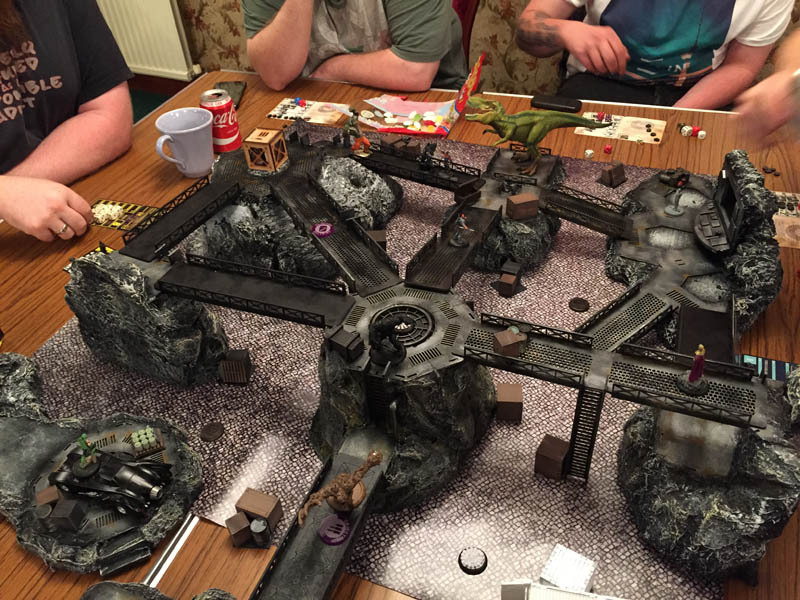 ), set up around the table then each took it in turns to take the lead once. Everyone took a different coloured die and put it in the bag, then we randomly drew each die out in turn so someone could take the lead. They first chose whether we would activate the rest of the characters going clockwise, or anti clockwise from the starting player. They then activated their character, then we moved onto the next person. 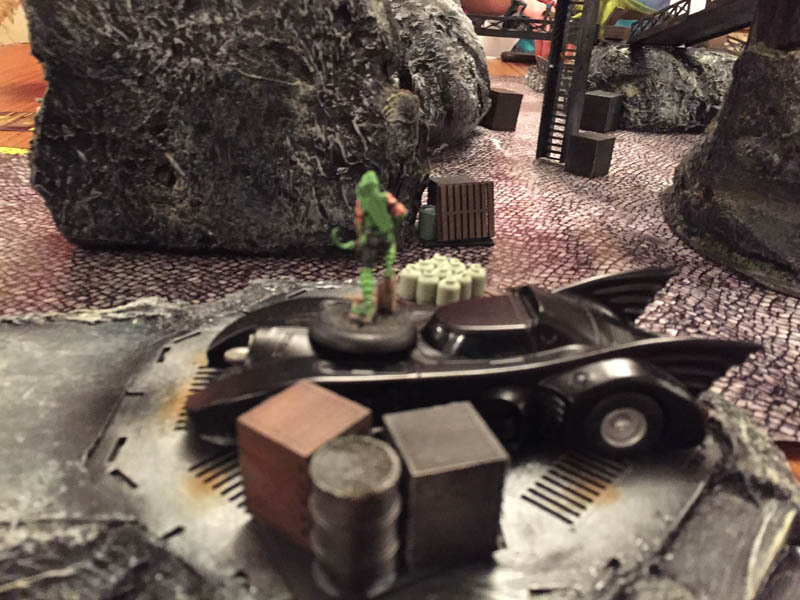 The Batman Miniatures game isn’t really designed for 9 people to play in one game. But the system coped well, and everyone had fun. Deathstroke pulls his counter of the bag to go first. (He picks anti-clockwise for the turn order). Moves onto the walkway. 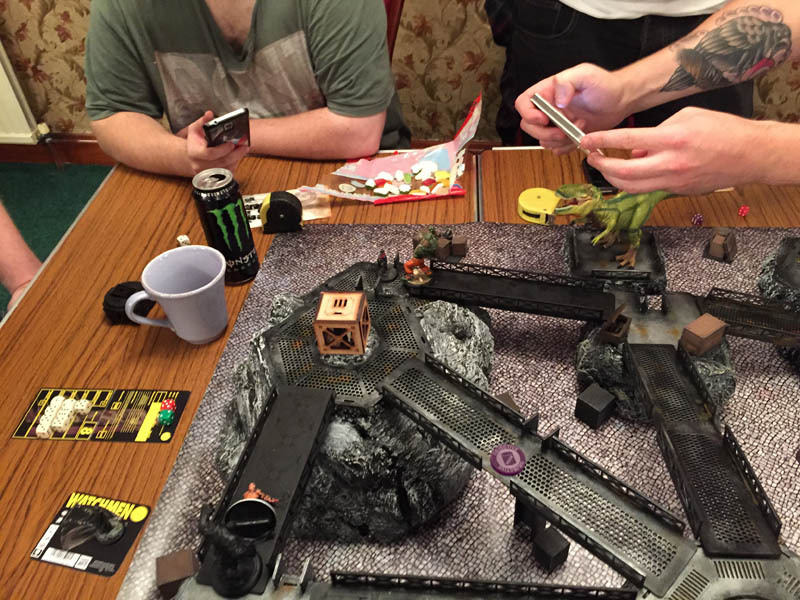 Batman starting on the floor near the Dinosaur batclaws up above deadshot, then tries to use his disruptor. He fails to disrupt deadshot’s guns! 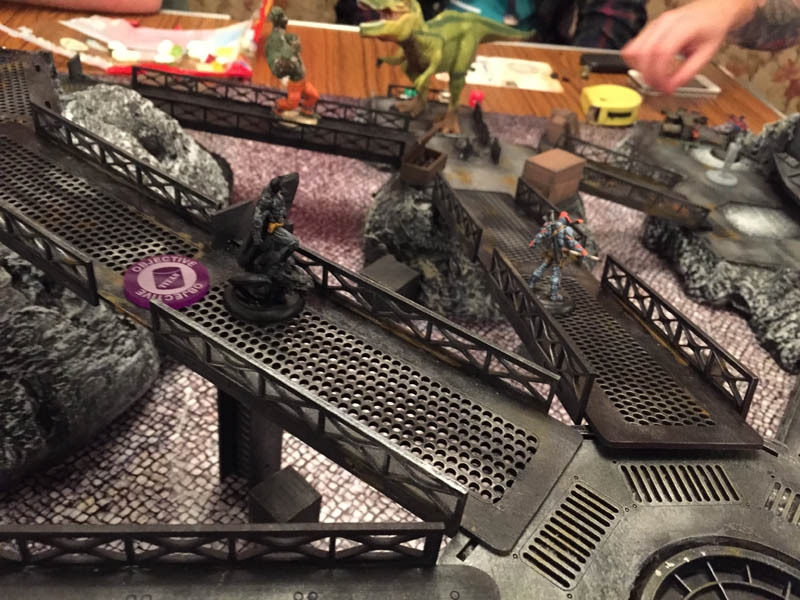 Sickle, starting on the top balcony near the penguins in a box, chooses to take a run at Solomon Grundy. He runs into combat. Misses. 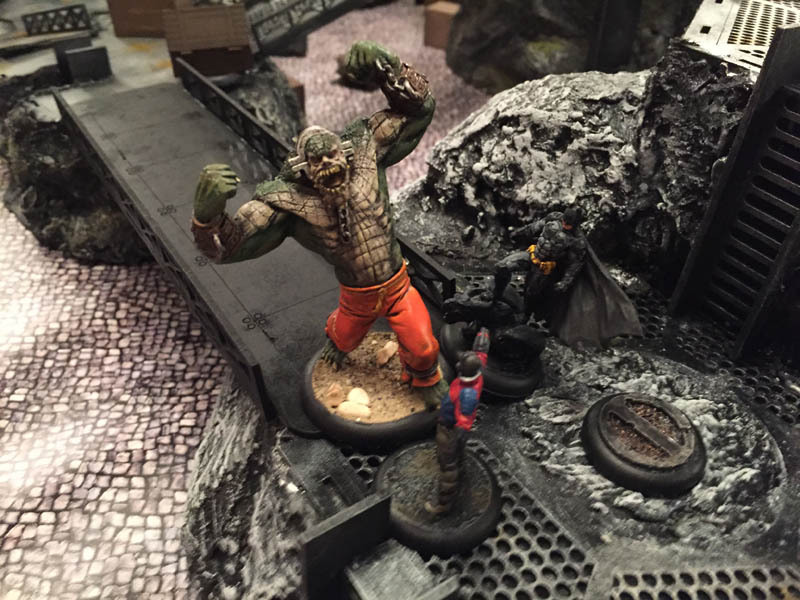 Solomon Grundy hits back, causes 2 blood and 1 stun onto sickle! Ozymandias, starting near the batmobile, moves along the walkway and up onto the top (same level as Deathstroke). 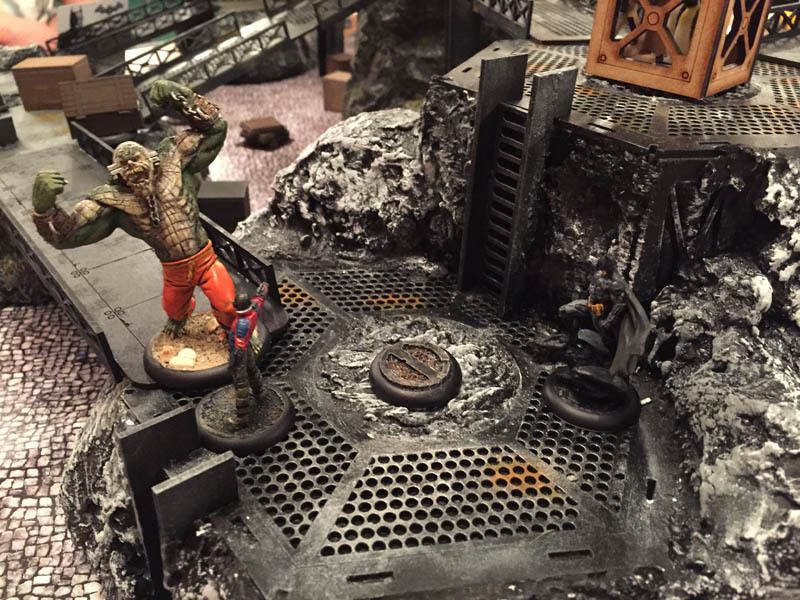 Killer Croc starting near the bat computer runs onto a platform. Ozymandias takes the lead! He attacks deathstroke, but deathstroke blocks all the hits. Sickle hits grundy 3 times, but Grundy blocks all three! 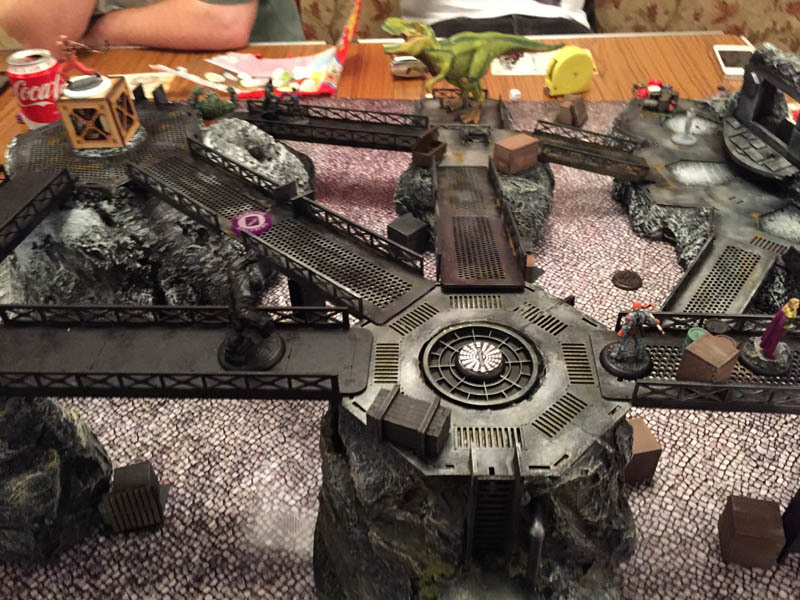 Batman leaps down from the higher platform above deadshot using his batcape (because it’s cool to use the batcape! ), he strikes deadshot and causes 4 stun damage. Grundy hits Sickle and manages to knock him out. 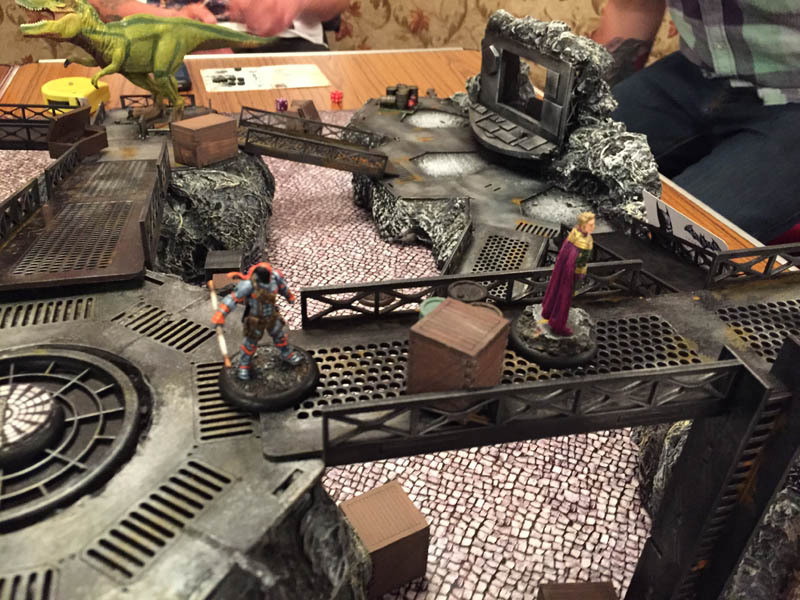 Deathstroke runs away from Ozymandias, towards the central platform. 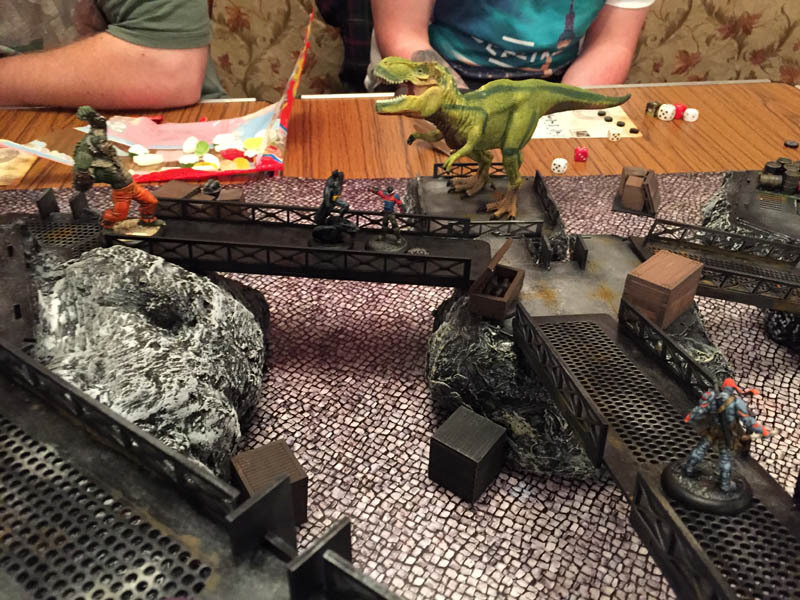 Croc runs up onto the platform, he can now turn towards Deathstroke (and Ozy), or Batman and Deadshot. Croc Takes the lead and decides to make the turn order clockwise. 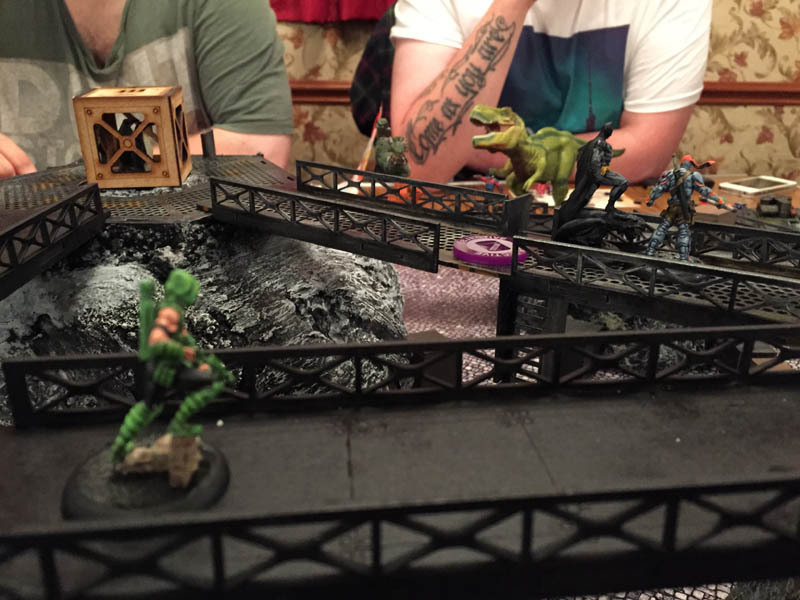 Croc does a run action towards deadshot, he makes it 28cm! but falls just short of getting into combat with Deadshot! Deathstroke charges Ozy, Deathstroke hits 3 times with his Bo-Staff, but Ozy blocks 3 times! Deadshot punches croc! Croc isn’t amused by this. Unfortunately for Deadshot, he also isn’t injured either. 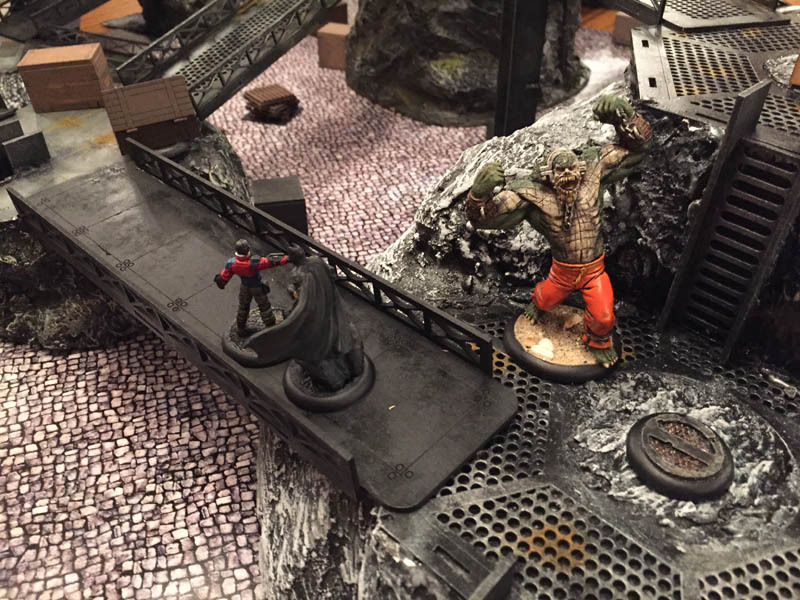 Grundy, standing over the KO’d body of sickle, makes 5 attacks. “Just to make sure”. he was sure. All hit, 8 blood. Safe to say, Sickle is dead. Batman charges Croc, hits him 3 times and does damage twice. His reinforced gloves make that 4 stun damage. 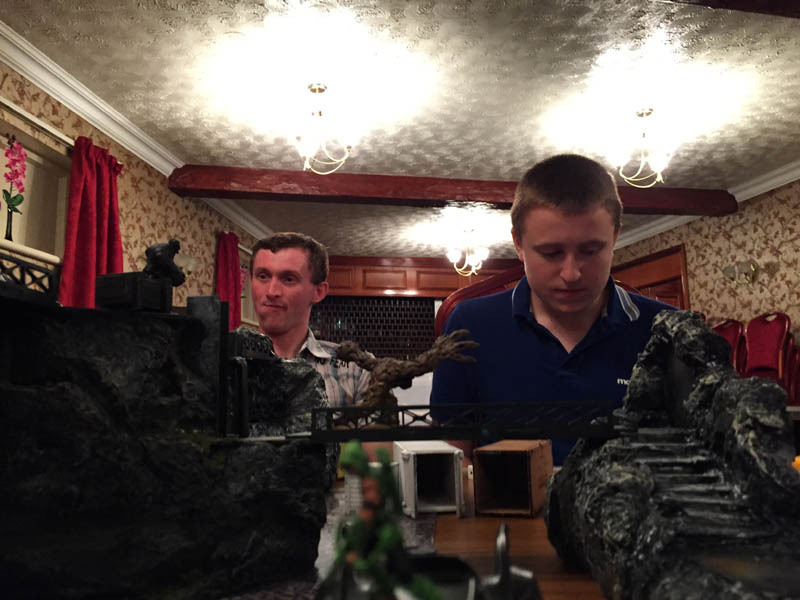 Green Arrow Shoots clayface with rapid fire. He hits once and causes 2 blood damage on him. 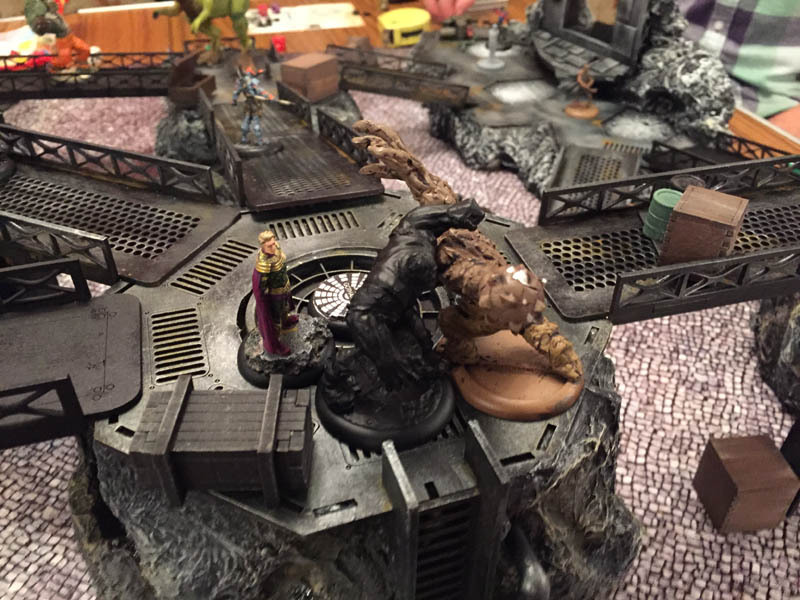 Clayface runs and jumps off the walkway, takes no damage from the fall (because he’s so big), finishes him move in contact with the container green arrow is standing on. He attacks but misses! 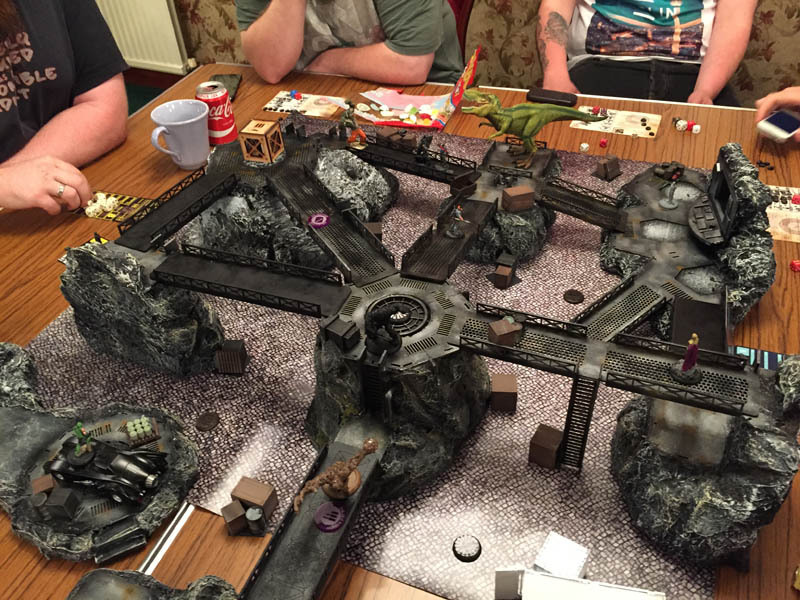 Green Arrow takes the lead and decides to go clockwise round the table. Green Arrow batclaws away from Clayface onto the walkway clayface was previously on. He manipulates the ammo marker to replenish his stun arrow. He shoots it at clayface and causes 2 blood damage. Clayface is now stunned! Ozymandias attacks Deathstroke, but his attacks all miss. clayface can’t spend any tokens so he moves back towards Green arrow with is basic move. Croc spends 4 attacks to hit batman, he misses with them all! he moves around batman to put batman inbetween him and deadshot. Deathstroke hits Ozymandias once, but Ozy blocks it. Deathstroke then moves away. Deadshot moves around Batman and croc onto the walkway, he uses rapid fire and shoots croc. He hits twice and causes 4 blood damage! 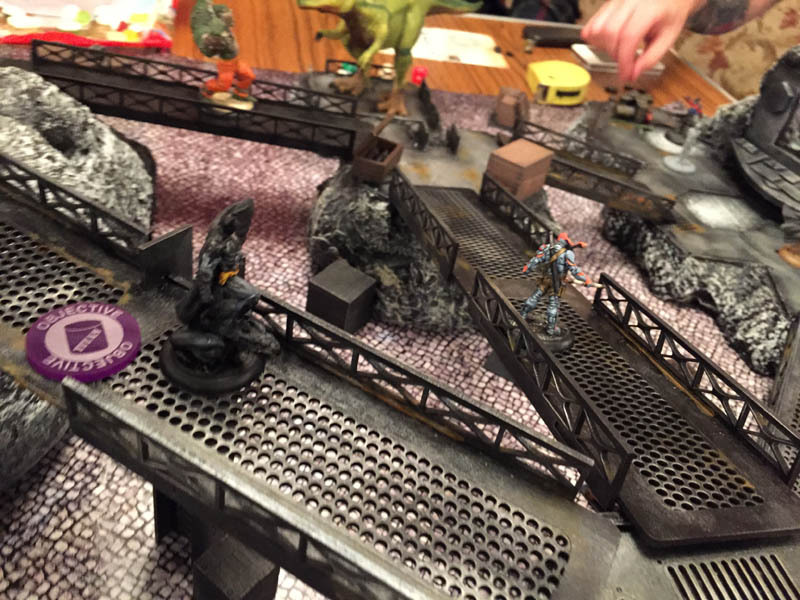 Grundy takes a run action towards Ozymandias and Deathstroke on the central platform. Batman Hits Croc twice. This knocks him out, he then moves into combat with Deadshot on the walkway. Croc passes his endurance roll and wakes up! Deadshot Goes first and goes anticlockwise. Deadhot moves away from batman down the walkway, he shoots, hits, but batmans Bat armour saves him! Deathstroke sees Grundy charging towards him and shoots him with his automatic gun. Causes 2 blood and 3 stun on Grundy. Deathstroke then moves round the corner. Croc moves into combat with Batman, he hits, batmans bat armour fails! He uses two defence dice which also fail! Croc fails to wound! 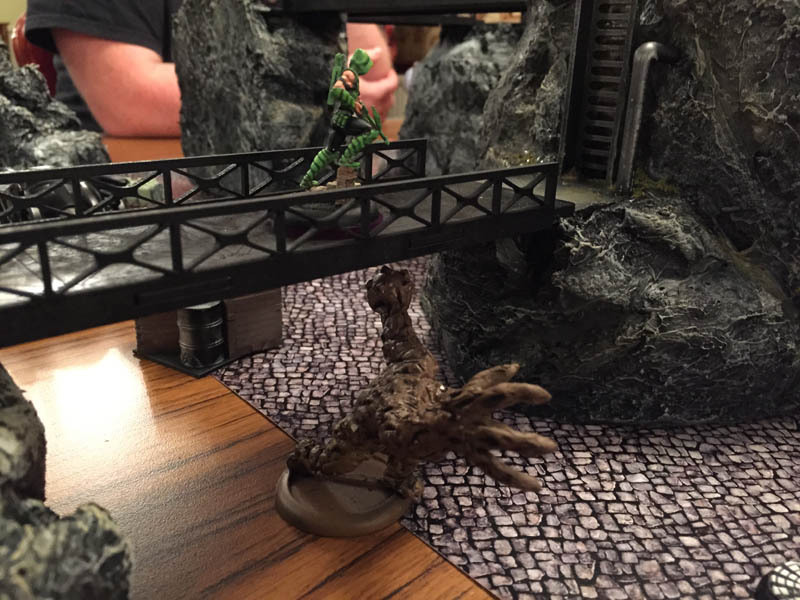 Clayface jumps up onto the walkway to hit Green Arrow. He hits, but GA blocks the blow. 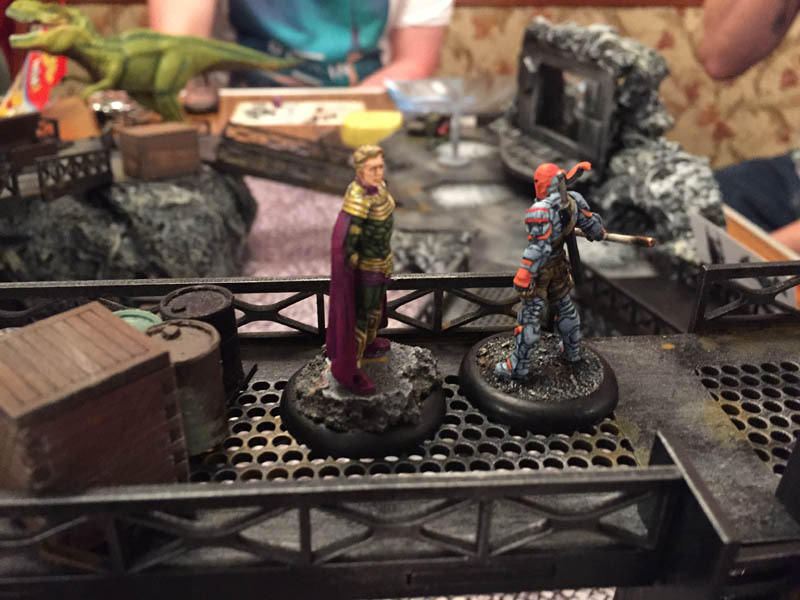 Ozymandias runs away from Grundy, not wanting to confront him alone. Green Arrow, faced with either Ozy, Grundy or Clayface, decides to batclaw away onto the batmobile. Batman moves away from croc, into contact with deadshot, punches him 4 times. 2 hits and 2 sucesses. 4 stun knocks out Deadshot. 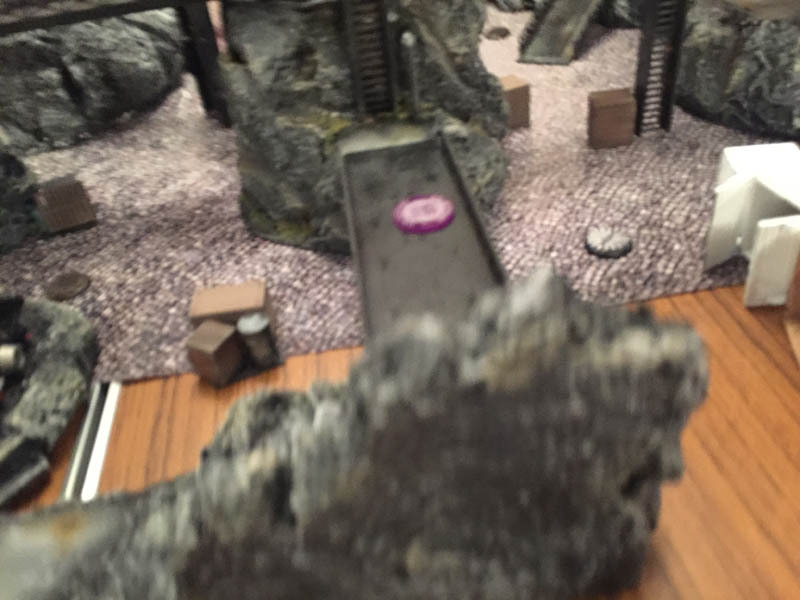 Grundy moves down the walkway and turns his attention towards clayface. Clayface manages to regenerate. He also takes the lead and comes up the stairs to fight Grundy. Clayface manages 2 hits on grundy, 2 blood, a stun and it’s a crit! so Grundy is knocked down! (they’re both large). Croc Charges batman, he makes 4 strikes but manages to miss them all. Deathstroke shoots clayface, he hits and does 2 blood and 2 stun damage. Batman, seeing deathstroke on the walkway above him, mutters “sslllaaaddeee”, then batclaws up to the ledge and attacks Deathstroke. He hits deathstroke, but he manages to block the attack. 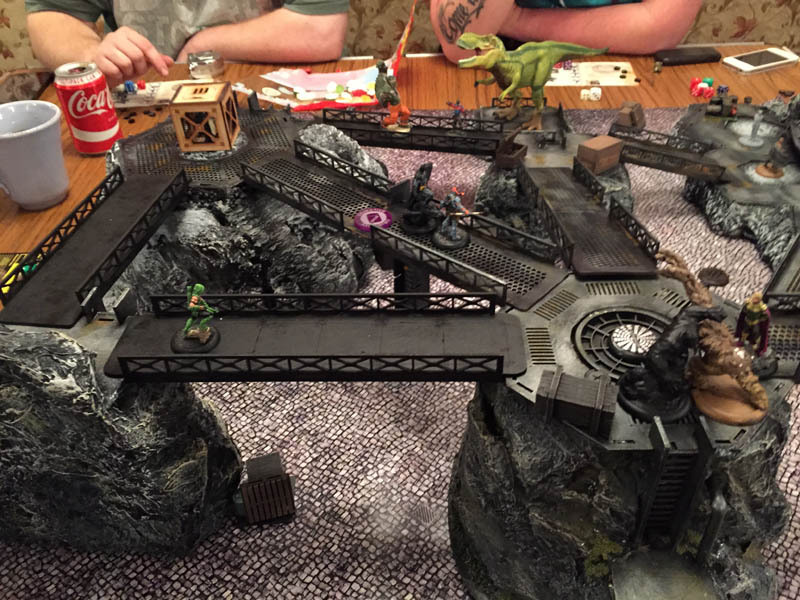 Green Arrow Batclaws onto the higher walkway. 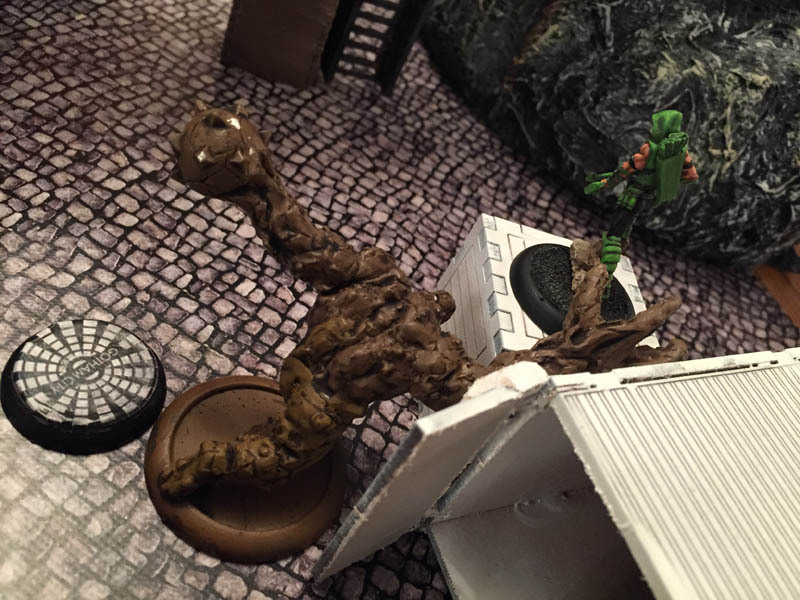 He shoots clayface, hits, but fails to wound. 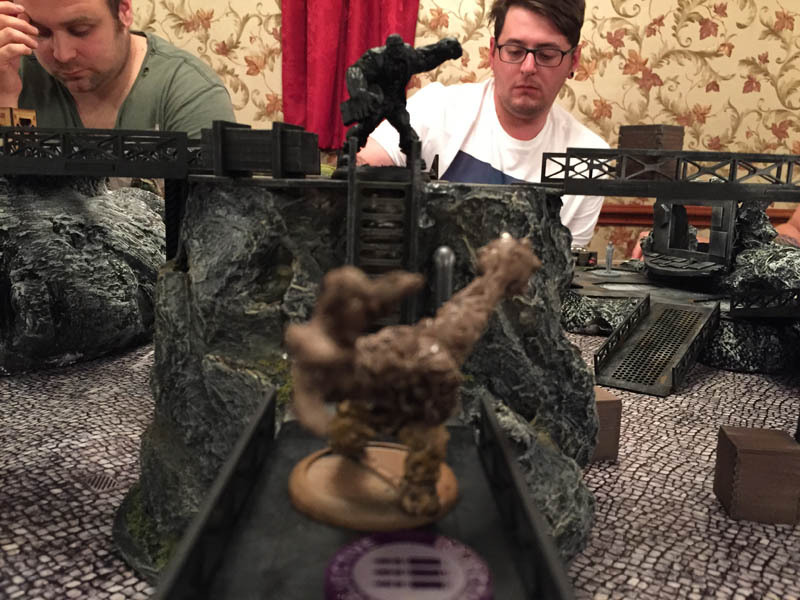 Ozymandias runs along the walkway, gets into combat with clayface. He rolls to hit and misses. Solomon Grundy takes the lead, he picks clockwise. Batman attacks Deathstroke with 5 attacks. He only manages to hit once, but Deathstroke anticipated the attack and blocks it with ease. 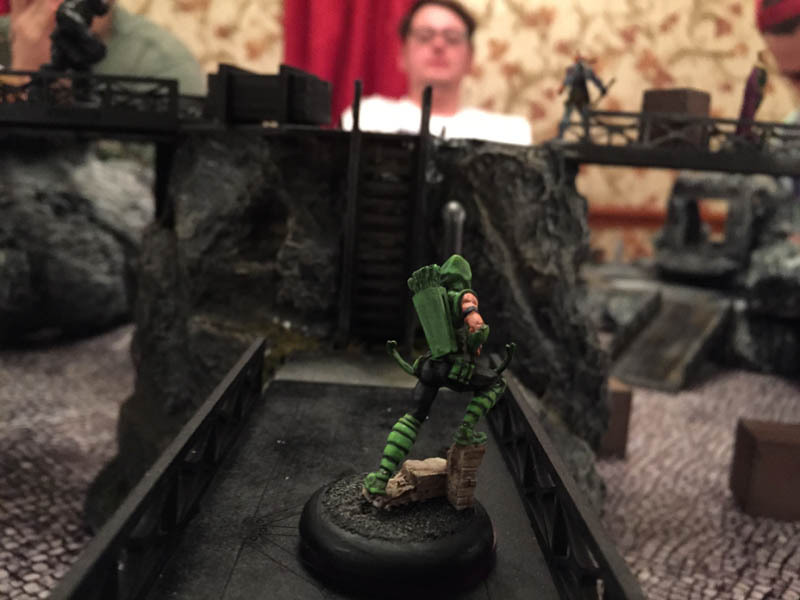 Green Arrow batclaws back down onto the walkway with the ammo counter and sets himself up for a target rich environment of Ozy, Grundy & clayface! Ozy manages to hit clayface once. it’s enough. Clayface is unconcious. 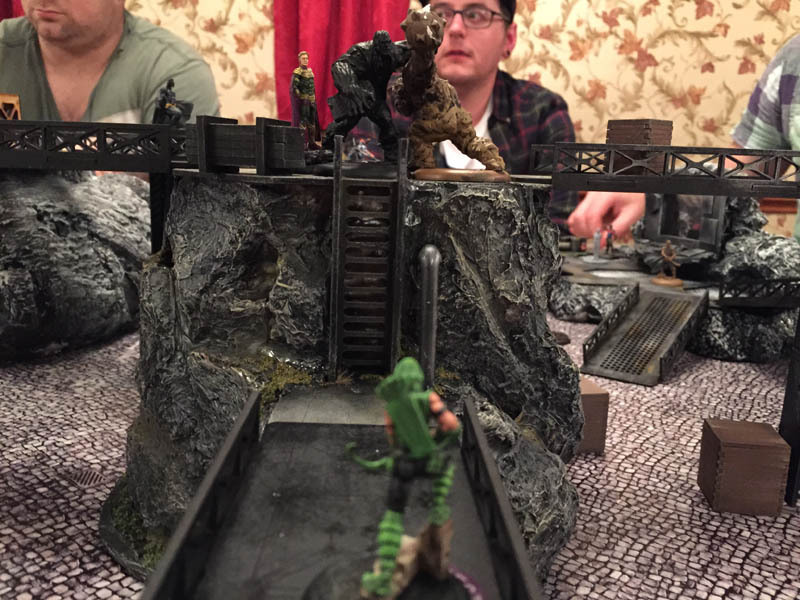 Croc moves along the walkway following where batman and Deadshot just fought. He finds a still unconcious snack, erm, I mean deadshot. Croc says Deadshot was very tasty. Deadshot is removed as lunch a casualty. Deathstroke attacks batman with his Bo Staff. Misses. Deathstroke jumps to another walkway away from batman. Batman takes the lead. Batclaws over to deathstroke, hits him with 4 strikes. 2 manage to hit. Deathstroke blocks twice. Ozymandias hits Grundy, 3 hits, but grundy manages 4 blocks. Clayface stands up. Hits grundy twice, manages to cause 2 blood and 1 stun damage! Grundy is now KO’d! Deathstroke jumps onto the other balcony again. *Official End of the game. Everyone has taken the lead once, but, there’s still time left and models on the table. so we play another turn. Only Sickle and Deadshot have been removed as casualties. 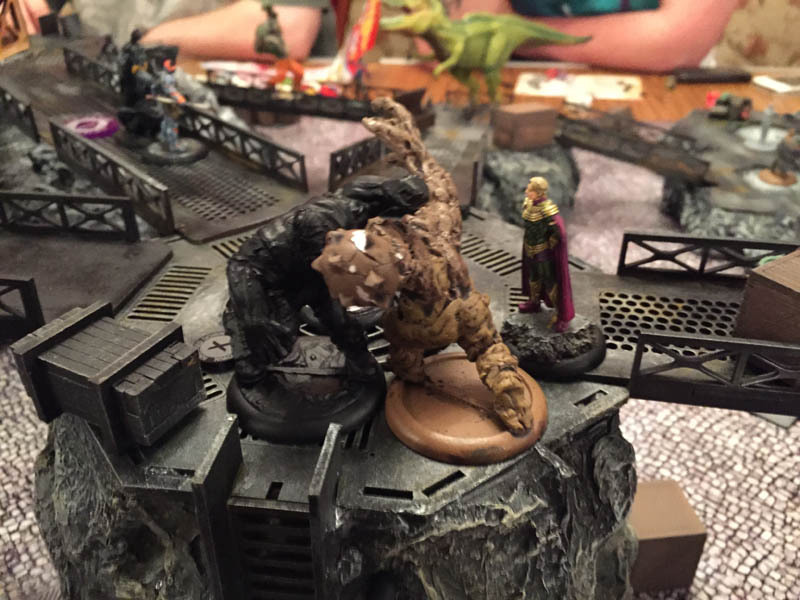 Croc has been knocked out but recovered, Grundy is currently unconscious, Clayface recovered from being KO’d last turn. Deathstroke has taken 6 blood damage. Batman is quite fresh with only 2 blood damage. Green arrow and Ozymandias are unharmed. Turn 9: – Unfortunately, the only pen we had was taken from me at this point so I missed a lot of what happened this turn! Croc hits Batman but fails to do any damage. Deathstroke, seizes his opportunity, jumps over the walkway into combat, croc being in combat means batman is outnumbered. Deathstroke makes 4 strikes against batman, who completely fluffs his defence rolls and might as well be standing in his pants because the bat armour fails too! 6 stun from Deathstroke puts Batman on the deck! KO’D!